The Moto X is sold unlocked with high-end specs and you can customize it to your liking. That's a pretty good deal for $400. Did Motorola finally deliver a great camera in the Moto X Pure Edition? It took three tries for Motorola to make an all-around solid flagship device, but we were patient. With the Moto X Pure Edition, the company made a phone with a decent rear-facing camera, Quad HD display, and a few special software features, all wrapped in a package that you can customize to your liking. It’s genius, really, and although the third-generation Moto X may be not be as packed with features as other flagships, at least you can bring home a phone that isn’t packed with bloatware. The Moto X is not overwhelming to hold, despite its 5.7-inch display size. If you’ve seen one Motorola phone in the last three years, you’ve pretty much seen them all. The Moto X Pure Edition looks a lot like last year’s Moto X, or this year’s Moto G. It’s no head turner like the metal-and-glass Galaxy S6 Edge, or even the unibody HTC One M9, but it’s a phone made in Motorola’s own style and I’m glad to see that the company’s stuck to an aesthetic it’s made all its own—even if it is getting a little repetitive. And unlike other phones, you can customize the Moto X by choosing from a variety of materials, including real wood and genuine leather backs. I went for the purple-hued polymer back for the Moto X Pure Edition, though you can choose from leather or wood, too. It’s not the thinnest phone on the market, but it won’t bulk up my pocket either. I’ve always thought the Moto X to be particularly ergonomic, and this year’s model is no different. It’s comfortable to use for extended periods of time, and even more comfortable to talk on than the larger Nexus 6. The Moto X also has an expansion slot subtly tucked away behind the nano SIM slot, as well as an NFC chip. It does not have a fingerprint scanner, however, which means you won’t get the security benefits of the new API that comes bundled with Android 6.0 Marshmallow. 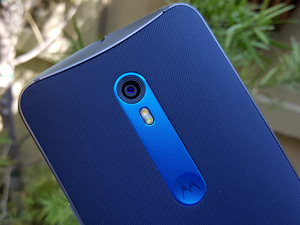 Motorola opted for dual stereo front-facing speakers with the Moto X Pure Edition. It makes for a much better listening experience if you want to stream the radio or a podcast over TuneIn, and the volume can get pretty loud. It also bumped up the display resolution on its flagship device to a 5.7-inch Quad HD IPS LCD. The screen is a good size for multitasking, though it’s not so overwhelmingly large that it doesn’t fit in your car’s cup holder. 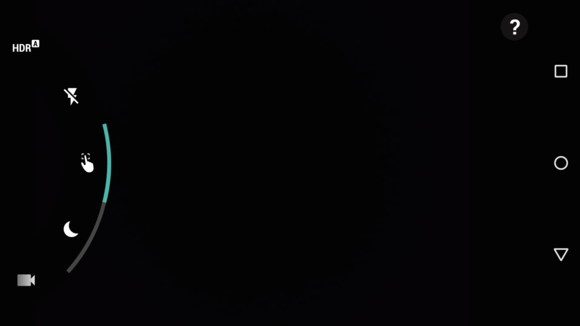 I read through my Pocket archive on the Moto X and its screen goes dim enough at night so that it doesn’t hurt your eyes, but don’t expect the same kind of color saturation you’d get from one of Samsung’s Super AMOLED displays. If you’re looking for a powerhouse, the Moto X just isn’t it. It runs on a Snapdragon 808 processor with 3GB of RAM, which is substantial enough for the variety of activities you plan to do with your smartphone, but it’s not a leader when it comes to benchmarks. 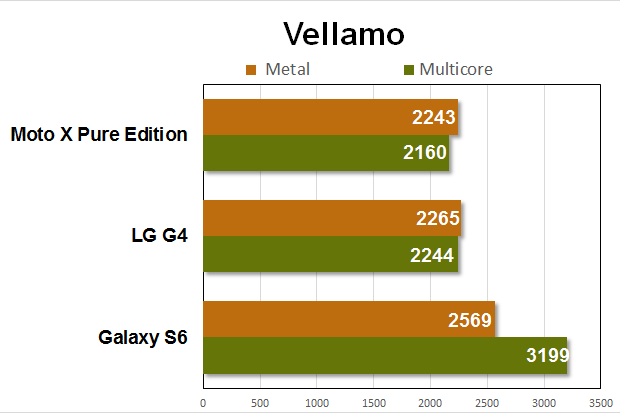 The Moto X delivers Geekbench scores in line with other Snapdragon 808-based devices. 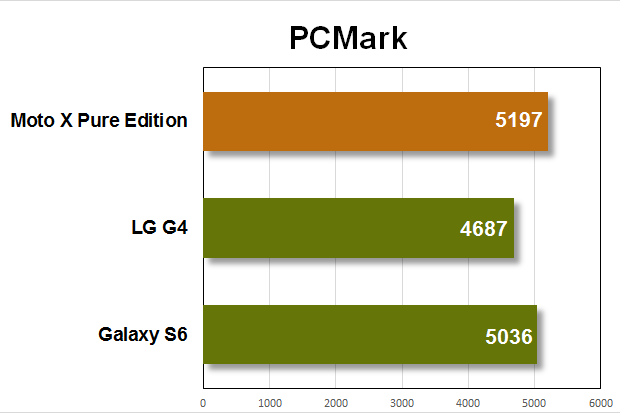 We're not sure why the PCMark score is so high, exactly. Again, right in line with other Snapdragon 808 devices. The Moto X Pure Edition performed on par with the LG G4, which runs on the same processor. 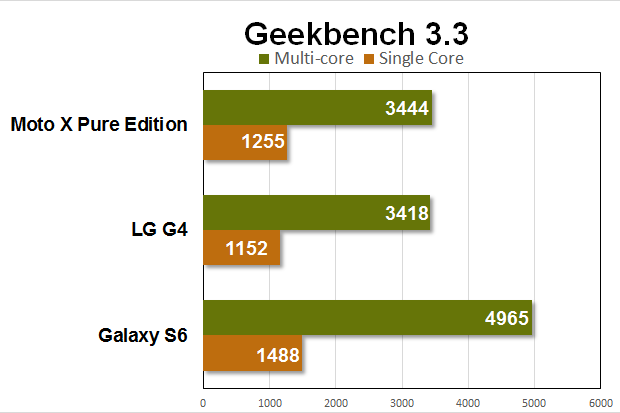 It passed the G4 a tad bit in PCMark and Geekbench’s multi-core benchmarks likely because the Moto X is running near stock Android, while the G4 is running LG’s overlay on top of Android. Regardless, if consistency is what you’re after, the Moto X is a reliable device and, since it’s sold unlocked, you won’t have to deal with carrier bloat. 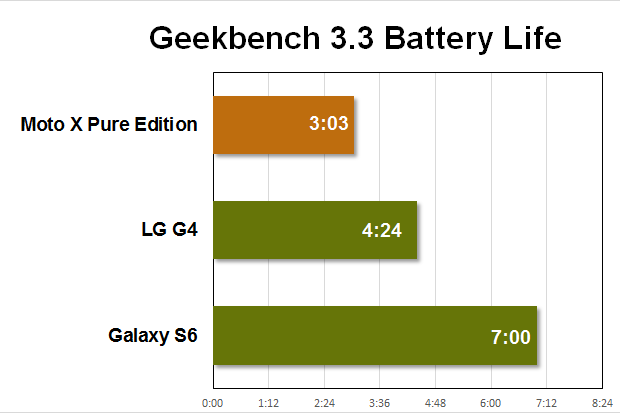 The Moto X performed poorly in synthetic battery tests, but real world use wasn't so dire. Battery performance is a different story. In our benchmark tests, the Moto X Pure Edition’s 3000mAh battery performed well below the G4, which has the same size battery pack, and the Galaxy S6, which has a smaller battery pack. You can squeeze a little more battery life out of the device if you turn down the screen brightness, though. I managed through 8 hours of average use with about 38 percent of battery left in the Moto X. Also, the phone supports quick charge, so you can plug it in and juice up enough in half an hour if the device is dying halfway through the day. In the past, if anyone asked me if they should bring home a Moto X, I would immediately caution them about the awful camera performance. The last two generations of the Moto X, and the Motorla-made Nexus 6, have had some of the worst performing camera sensors for a flagship phone. I’m glad that with the Moto X Pure Edition, Motorola has finally made camera performance a priority. The Moto X Pure Edition takes shoots in 4:3 at 21 megapixels. If you go lower than that, it shoots in 16:9. The Moto X performs so much better in low-light situations than its predecessors. This year’s flagship features a 21-megapixel rear-facing camera with an f/2.0 lens. It quickly snaps photos in plenty of light, though it’s a bit slower in lower light settings. Most of the photos I took came out clear and ready-to-share, though I was hoping for slightly better low-light performance. The Moto X performed fine in the studio, but outside at night and in darker rooms, it performed a notch below the Galaxy S6’s f/1.9 lens. The Moto X does offer impressive manual focus controls. That’s not to say that I’m not impressed with the Moto X’s camera abilities—it’s a huge improvement over previous models. You won’t be ashamed to post your heavily-edited photos to Instagram with this phone. It’s also nice that the Moto X has added in a few manual camera controls. There’s a semi-manual mode that lets you adjust the focus and brightness of the photo. It works impeccably, and I liked how quickly it switches between focus subjects in real-time. Motorola’s camera app has always offer a sort of too-plain and slightly finicky camera interface. I don’t like the interface in Motorola’s camera app. It’s too finicky to use and I hate having to slide my finger from the edge of the screen to bring out the menu. Oftentimes, the interface mistakes my slide as a tap, and then I accidentally shoot a photo I didn’t mean to. I still prefer a camera interface similar to what LG, HTC, and Samsung have, rather than Motorola’s stock Android camera app knockoff. The new Moto X offers front-facing flash. At least your selfies are safe. I liked the end result of photos taken with the Moto X’s 5-megapixel front-facing camera, though I wasn’t too keen on the front-facing LED flash nestled next to it. In theory, using flash to take a photo of people in a low-light setting is a good idea because you can capture their faces, but flash makes most people look awful. I’d rather the front-facing camera have a larger aperture for better low-light photos rather than a stark white, bright flashbulb. The Moto X Pure Edition is pretty much stock. The Moto X runs a slightly edited version of Android 5.1.1 Lollipop. It’s fast, it’s reliable, and it’s almost the same Android you’re using on a Nexus device. As with the last Moto X, this generation’s device comes equipped with a few software enhancements that Motorola’s reserves especially for its flagship handsets. This includes gestures like Moto Display, which enables you to wave your hand over the phone’s display to bring up the time and notifications, and features like Moto Voice, which now lets you discreetly call on a command by holding up the phone to your ear. You can also use Moto Voice to do things like make a reminder or post a status update to Facebook without even unlocking your phone. Motorola also bundles in applications like Connect, which helps you manage external devices like Android Wear watches and headphones, and Migrate, though the company plans to rid of these applications once the device is updated to Marshmallow. Also, I wouldn’t worry about when you’re getting Marshmallow with this device. Motorola may have nixed support for this year’s Moto E and the carrier versions of last year’s Moto X, but it’s had a pretty solid track record thus far when it comes to software updates on premium phones. And you won’t have to wait on your carrier. The Moto X Pure Edition is great. Just great. Motorola has a truly solid flagship device to throw into the ring, and though it’s not as powerful or as polished as Samsung and LG’s respective flagship devices, the Moto X Pure Edition really is a good phone. It does feel all too familiar, however. Like Motorola’s too afraid to take the plunge into new design territory and go to head-to-head with some of its other, more flashy competitors. That’s okay for now because what the Moto X has going on works. I just hope whatever’s next is a little more extraordinary than ordinary. With better camera performance and the ability to customize your own phone to your liking, the Moto X Pure Edition is not a bad choice for a daily driver.